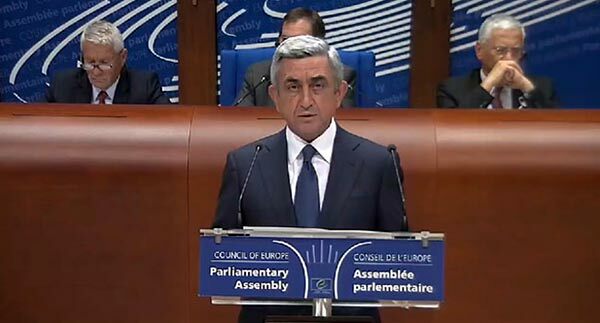 Armenia is committed to developing close relations with the European Union, said President Serzh Sargsyan in his speech at the plenary session of the Council of Europe Parliamentary Assembly (PACE) in Strasbourg on Wednesday. “We have said and continue to say that Armenia aspires to be close to Europe,” said Sargsyan, emphasizing that at the same time Armenia also has allied relations with Russia. “Armenia has never aspired to build cooperation with one partner as opposed to another,” stressed the Armenian leader, who announced in early September his government’s plans to join the Russia-led Customs Union. The president of Armenia also stressed that Armenia was ready to sign a modified version of the Association Agreement with the EU at the Eastern Partnership summit in Vilnius, Lithuania, in November, albeit without ithe Deep and Comprehensive Free Trade Area agreement that contradicts Armenia's membership in the Customs Union. Sargsyan said Armenia attached high importance to reforms to be carried out as part of the process. In Strasbourg, Sargsyan reiterated Armenia’s commitment to finding a peaceful solution to the Karabakh problem. He also answered questions posed by member of the Armenian delegation Zaruhi Postanjyan regarding his lacking legitimacy as president to represent the Armenian people and allegations that he gambled and lost 70 million Euros in a European casino. “I do represent the Armenian people, and I’m proud of it. Unfortunately, your candidate [Heritage Party leader Raffi Hovannisian] was not able to display the kind of qualities that one would need in presidential elections to be able to represent the Armenian people,” said Sargsyan. As for the allegation about the casino, Sargsyan described it as “another product of your [Postanjyan’s] imagination”. “I have never been to any casino in Europe, I do not gamble in casinos. Unfortunately, I have no opportunity to be in possession of 70 million Euros. If I had such an opportunity, I would donate part of it to you to be happy with your life and not to have so much evilness in you,” he said.